After what has felt like an eternity, M. Night Shyamalan delivers a knockout with his new thriller, Split. The film marks the glorious return of one of the most joked-about directors ever. However, in 2004 his career took a turn for the worst when he directed The Village. Audiences have doubted his talent ever since. Fortunately, they won’t doubt him after seeing his latest picture. 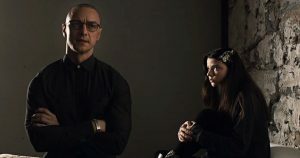 Split follows Casey Cooke (Anya Taylor-Joy) and her two friends that were kidnapped by a man (James McAvoy) who has 23 distinct personalities. After conversing with a few of these different identities, the girls learn that a new, and extremely dangerous, personality is about to emerge. Shyamalan is right in his wheelhouse with his latest feature. He has crafted an unpredictable psycho-thriller that will have audiences on the edge of their seat. It also explores the fascinating idea that those with Dissociative identity disorder can change their chemistry and alter appearance or abilities. For example, one character mentions a blind woman with DID, whose alternate personalities developed sight. This is the notion that drives the story in Split. Beyond the captivating concept and intense tone, this movie showcases the incredible talent of McAvoy; his performance is jaw-dropping. While his character has 24 personalities, Split only shows us five of them. However, each of them has a distinctive walk, diverse mannerisms, particular accents or ways speech, and overall different demeanors. In one scene, McAvoy will be portraying a personality that is an eight-year-old boy named Hedwig. His word choice is repetitive, his tone fluctuates, his eyes wander, and he moves with uncertainty. In another scene, he portrays a personality named Patricia, an older woman. His walk is reserved, his voice is monotone with a touch of kindness, he consistently maintains eye contact, and he walks with the utmost confidence. It may sound simple enough, but while watching Split, you’ll feel like these are different characters. McAvoy simply disappears in every one of them. That being said, Taylor-Joy delivers an equally impressive, but subtle performance. She doesn’t have to take on the feat that McAvoy does with multiple characters, but she communicates her vulnerability and fear with her expressions masterfully. Now, about the signature Shyamalan twist. Just when you think the film is going to close without a huge twist, he punches you in the face. I can guarantee, if you avoid revealing websites, you’ll NEVER see what’s coming. It comes out of nowhere, and it will blow your mind. Split is a solid, intense thriller that boasts excellent performances and the return of a director we’ve all been missing.